Considered locking in a Grimstad vacation package? It's really simple with Expedia, and you'll be able to buy some nice meals or souvenirs for your buddies back home with the money you save. Book your package on Expedia and gain savings of up to C$590*! It's that simple! You don't have to worry about postponing your family's plans, as we don't charge additional cancellation fees for almost all of our reservations. We have all the sightseeing info you require for your forthcoming trip to Grimstad. Grab your travel planner and get ready to start filling that itinerary. Reconnect with nature at Reddalsvann Nature Reserve and see the valuable work they're doing to preserve our native habitats. There's an excellent range of things to keep you busy in this destination. Would you like to add some greater meaning to your travels? Take yourself on a pilgrimage to Landvik Kirke. Regardless of your beliefs, it's the perfect place to connect with the local faith. Still have time on your hands? Eager to get into the outdoors? The wide open landscape at Sykkelbyen is a terrific place to kick a ball around or just sit back and relax. If you're after cheap vacations or luxury getaways in Grimstad, it's recommended you book a place to stay ahead of time. There are just 2 Expedia properties currently on offer. 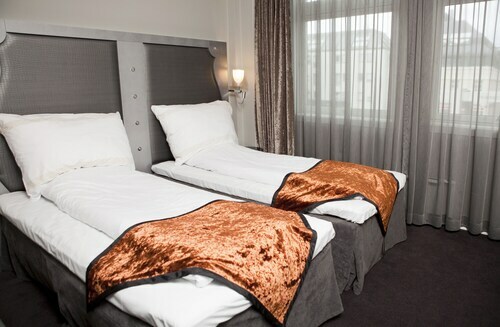 If you're searching for properties with good reviews and comfy beds, you can't go past the Strand Hotel Fevik (Nedre Hausland 80) and the Scandic Grimstad (Kirkegaten 3). No one loves standing around at the airport. But it's well worth it when you remember the trip that's waiting for you! Located 20 miles (32 km) southwest of Grimstad, Kjevik Airport (KRS) is the most convenient terminal. 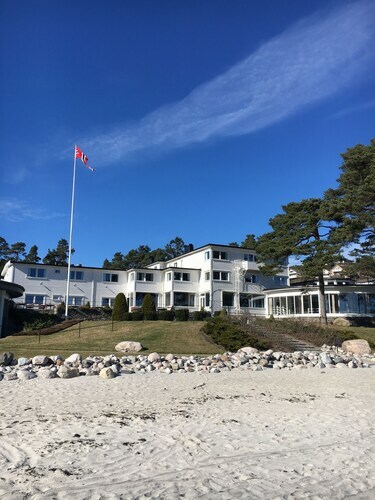 Nestled on the beach, this Grimstad hotel is within 9 mi (15 km) of Fjaere Kirke, Groos Recreation Ground, and Ibsenhuset og Grimstad Bymuseum. Arendal Tennis Club and Bulder Lekeland are also within 12 mi (20 km). 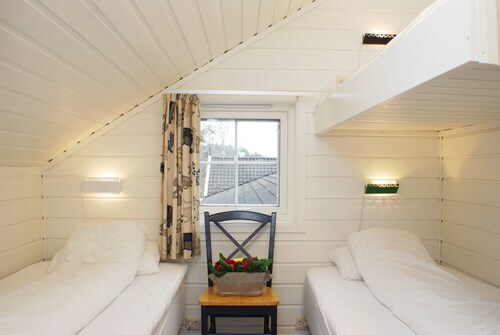 Located in the heart of Grimstad, this hotel is 0.1 mi (0.1 km) from Ibsenhuset og Grimstad Bymuseum and within 3 mi (5 km) of Groos Recreation Ground and Fjaere Kirke. Lillesand Town Hall and S.N. Hansen's Park are also within 12 mi (20 km). Situated in Grimstad, this campground is 0.7 mi (1.1 km) from Ibsenhuset og Grimstad Bymuseum and within 3 mi (5 km) of Fjaere Kirke and Groos Recreation Ground. Arendal Tennis Club and Bulder Lekeland are also within 12 mi (20 km). 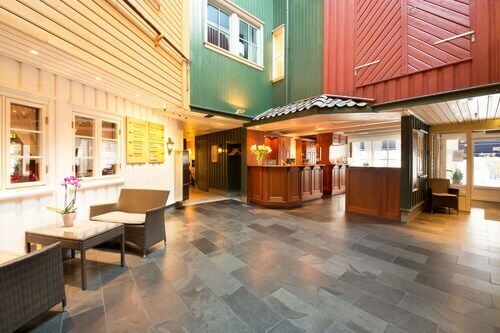 Situated in Kristiansand, this aparthotel is within 1 mi (2 km) of Aquarama Bad and University of Agder. Christiansholm Festning and Kristiansand Domkirke are also within 10 minutes. Kristiansand Station is 15 minutes by foot. 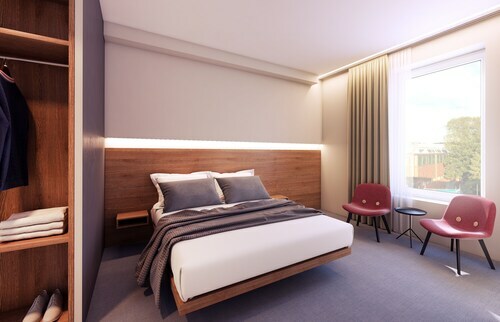 Located in the heart of Kristiansand, this eco-friendly hotel is 0.3 mi (0.4 km) from Kristiansand Cathedral and 1.7 mi (2.7 km) from University of Agder. Kristiansand Domkirke and Christiansholm Festning are also within 10 minutes. Kristiansand Station is 6 minutes by foot. 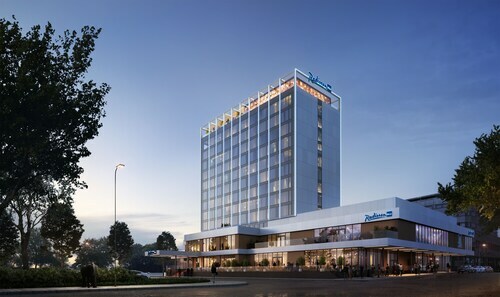 Located in the heart of Kristiansand, this hotel is 0.1 mi (0.2 km) from Kristiansand Cathedral and 1.7 mi (2.7 km) from University of Agder. Kristiansand Domkirke and Christiansholm Festning are also within 10 minutes. Kristiansand Station is only a 4-minute walk. Located in the heart of Kristiansand, this hotel is 0.2 mi (0.3 km) from Kristiansand Cathedral and 1.7 mi (2.8 km) from University of Agder. Kristiansand Domkirke and Christiansholm Festning are also within 15 minutes. Kristiansand Station is only a 3-minute walk. Located in the heart of Kristiansand, this hotel is 0.1 mi (0.1 km) from Kristiansand Domkirke and 1.5 mi (2.4 km) from University of Agder. Kristiansand Cathedral and Christiansholm Festning are also within 10 minutes. Kristiansand Station is 8 minutes by foot. Fri., 21 Jun. - Fri., 12 Jul.